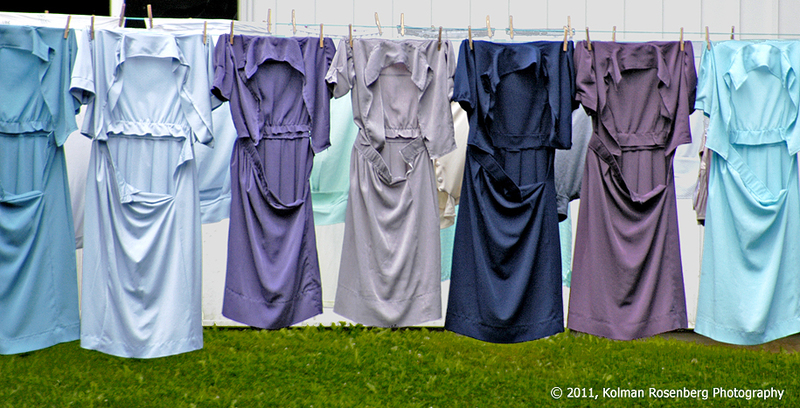 Amish dresses hang on a clothesline to dry. Few people outside of Ohio realize that this state has the highest concentration of Amish in the U. S. Northeast Ohio has many Amish communities where the farms and businesses are frequented and owned by members of this community. A nearby Walmart even has a hitching post in the parking lot for the Amish horses and buggies! I often drive around looking for interesting photo locations, sometimes in the city and sometimes in the more rural areas. I found this image waiting for me out in Ashtabula County and couldn’t resist it. The colors of the dresses hanging on the clothesline defies the common monochrome image that we have of this community. I passed by this scene and quickly turned around, pulled to the side of the road and grabbed the shot. For this and other shots that I’ve captured while driving around, my friends have dubbed me a “drive by shooter”! This entry was posted in Uncategorized and tagged amish, ashtabula, clothesline, community, county, dresses, drive by shooter, mennonite, ohio. Bookmark the permalink. It looks like my girlfriend’s yard on laundry day! Your photo shows such a simple beauty that it elicited a prolonged “Ooooh” from me. I’m still smiling.